Maureen Jennings | TV, eh? It’s always fun to catch up with Maureen Jennings. As most of you know, without her there would be no Murdoch Mysteries. I spoke to the author, who created Detective William Murdoch, to discuss the episode she wrote, “One Minute to Murder,” and what didn’t make it into the episode. Wow, 12 seasons. Are you surprised that Murdoch Mysteries has gone on this long? We talked a little bit about this last year, and how the storylines come about. You had told me then that you usually pitch three or four episode ideas and then they select one. Is that how it worked for tonight’s episode, “One Minute to Murder”? MJ: Actually, no. That’s the typical way, but I was very pressed for time this year. I felt a bit guilty about this. I went in with literally an idea, as opposed to a developed story of any kind. This was the typewriting competition, which I had come across, and I used in another book, actually. I’d come across this at some point with a fantastic photograph of these very, very dressed up folks watching a typewriting competition. They were very, very popular. I guess the competitive nature of them. Big purses and I don’t know. It’s a bit hard to imagine, somebody going in with a keyboard on his computer and everyone spending whatever amount of money. Hundreds of people coming in watching you do your keyboard. I thought it was very funny. Anyway, I literally went in with just that idea. Not even what happens, except that it’s around the competition. The writing room was great. They just took that and developed a story. We kind of have to have a crime in there. I didn’t. All I had was a typewriting competition. That’s how that evolved this time. It’s interesting you say, it’s a little bit shocking imagining a room full of well-dressed people watching a typewriting competition. The thing is there are people that sit and watch people playing video games all the time. We may be and 2019, but people will still watch other people doing things. MJ: Right. That’s a good way to put it. I would have been impressed, I’m sure, but the speed, the unusual speed of these competitors. I guess the same if you don’t play video games, and you’re seeing these kids doing these brilliant things. You go, ‘Wow! That’s really good.’ I found another picture afterwards that was taken at the CNE, and the same thing. A whole bunch of people crowded around watching this guy typing. So there you go. You pitched this little nugget of a story idea to the writer’s room. When you say that they developed it, how involved were you in the writing of this episode, besides coming up with this competition? MJ: Well the typical process is they broke the story. They had all the beats, which is another word they use. I went in and they presented me with that, and there was another story that was already developing about Murdoch and Julia writing a book. There’s been I think at least three episodes where that’s been going on. That was in the episode as well. So they present me with that, and then I went home, and wrote it up, and added my scintillating dialogue. Then it goes back, and people do this and that and the other. I had a little less involvement than typical developing the plot, I must say. And as I said, I felt a bit guilty about that, but it was a fun idea to them, so I think they were OK.
Louise Cherry is an interesting character. A lot of people don’t like her, because of the things that she said about William and Julia in the past. The way that she treats the police. How do you feel about her, and what was it like writing for her? MJ: Well, good question. How it was initially presented to me was we want to do a story around journalistic ethics, which I was dead keen to do. I like stories about ethics. I did a bit of exploration with that. I called the Ryerson Journalism department. Now, unfortunately, because of the actual time constraints, it’s not a lot of time in the episode, as you know, to develop much of the story. All of that ethical stuff, which I was very interested in, kind of got cut actually, but we had three ‘suspects’ who, for me were each representing an aspect, and ethical aspect of things, which is so current today. But we couldn’t really develop that. I wanted to make Louise Cherry a little more vulnerable. But that got shot down. I wanted her to be a bit softer, and they wanted her to be a bit tougher. There was that little bit there. She let the wall down a little bit with George. MJ: As a character, I think she’s nicely multifaceted, actually, but I certainly, personally always like it when we get a bit of the softer side of her and other people. Anybody, whoever it is. I think we’ve done with a lot of the characters, actually. Peter Mitchell posted on Facebook the other day, and he wanted to know everybody’s Top 5 favourite episodes. Do you have a couple of favourites or five favourites? MJ: I don’t want to hurt anybody’s feeling who’s not on my list, as it were, but I particularly have liked ‘The Accident.’ That’s been nominated for a Canadian Screen Award. Way back, I really liked ‘Dead End Street.’ I thought that was very good. I must say I liked ‘Shipwreck,’ which was from my book. I thought that was a good episode, regardless. I liked the most recent episode, too, that Simon did. I thought that was really good. MJ: Yes. Yes. Again, my whole orientation is definitely to emotion and relationships and the past and everything. I thought that came off really well. Over the years there are things that have been quite outstanding. I look back on them and go, ‘Wow!’ It’s still amazing. What have you got coming up, Maureen? I’ll, of course, point folks to your website. MJ: Oh, thanks, Greg. Let me see. I’ve finished a book and it will be released in March. March 23rd. It’s called Heat Wave: A Paradise Café Mystery. This came about because I read that in 1936—it’s set in 1936—there was a heatwave in Toronto, and Canada, that has never been equalled before or since. You know we’ve had some sweltering summers. But this was just beyond, beyond. I really was grabbed by that. I thought, ‘OK.’ I wrote a short story about it for Taddle Creek magazine. Then I said, ‘Hey, I like this. I’m going to develop into a book.’ So, that’s the most recent one, and with a female PI. I like creating a world that seems real, so in ’36, Murdoch’s son, who isn’t in the TV show but is in my book, is now 40. He comes into the book as and then Murdoch has retired, not to keep bees, but more or less. He’s retired to Nova Scotia. The book before this one is 1917, where I’m completely immersed at the moment, Canada in World War I, Murdoch is 56, and he’s the centre of the story. Then in this most recent book. He’s not. It’s his son. That’s fun. It’s always a pleasure to speak to author Maureen Jennings. After all, she created the character of William Murdoch that we’ve enjoyed first in her novels and then on television. Monday’s newest episode, “Game of Kings,” contained several noteworthy moments and storylines, among them a history of Poland, the intricacies of chess and how everyone in Station House No. 4 knows Julia is pregnant. I spoke to Jennings about writing Monday’s instalment and what fans can expect from her latest Murdoch novel, Let Darkness Bury the Dead. This was a fascinating episode that contained a lot of Polish history, including the hussars—the winged calvary—and the coronation sword, Szczerbiec. Where did the inspiration for this episode come about? Maureen Jennings: I was invited to Poland as part of a writer’s festival, so I learned a little bit of the language. Then I came across the story of the husaria, the winged horsemen, and the ceremonial sword. I thought it all was a great possibility for an episode. Then I came upon the real story of a chess tournament that had happened in the United States—I think it was in 1904—and thought it was a great combination, especially these days, to have an international chess tournament and have all of this other nationalism going on with the Polish husaria. At the time, Poland was occupied by Russia and it was a difficult time. Through this tournament, some of these ancient conflicts would show themselves. It’s amazing that, as reflected in this episode, the coronation sword really was brought to Canada for safe-keeping, though that was during the Second World War. All of that came afterwards, so I thought it was great. I fiddled a little bit but it was not at all implausible that there would be this sword here. It was a great connection. How did you go about fleshing out the chess storyline, regarding Crabtree, Higgins, Watts and Nina? Initially, I pitched a blindfold chess tournament that I got very attached to. Again, this was all based on true events. One man played, I think, 22 boards at once. He had his back to the boards and had to keep all of those games in his mind which I think is phenomenal. But when we talked about it, Peter thought it would be a bit difficult to do it that way and that the more traditional tournament that ended up in the show would be a bit easier to film. Chess is a funny game because it’s very quiet and formalized conflict and I really enjoyed trying to depict that. The history of chess goes back far in Canadian history. At least as far back as 1872 with The Chess Federation of Canada. I’m always finding out interesting information like that. I like chess and I did a lot of study on it for this episode. I was so impressed with these chess geniuses. There was that wonderful moment when it was revealed that Nina and Karina were the truly skilled chess players and the men were just making the moves as instructed. Yes. Again, women were not playing as much but there was a women’s league and they were fantastic as well. How does it work with regard to which episode you’ll write in a season? What has been the most challenging transition when you go from writing a novel to writing a television script? I had to constantly be aware of my words. In the beginning, Paul Aitken was always telling me I was writing too many words. I had to really keep it in mind that this was a visual medium and to cut that down. That wasn’t so hard. What was challenging and fun to learn more of the mechanics of a TV show. It’s not just the script as such. In the first episode I wrote, for example, that there was a big thunderstorm. That’s not a big deal for me—I just write ‘big thunderstorm’—but in fact on a set, rain and snow are very difficult to do. Nobody wants to do rain because you ruin the cameras, never mind the cast. It’s things like that that I had to think through. It was revealed, in very funny fashion, that Julia is pregnant and everyone knows. How do you feel about her being pregnant? I like that thread. It’s been going on for a while and set up quite well. Finally, let’s discuss your latest novel Let Darkness Bury the Dead. This is your first Murdoch novel in years. What’s it about? I advanced the story to 1917 and it turned out to be a fabulously interesting time period. I often say that sometimes writing a novel changes your life and I think that’s the case with this. It was so amazing to study that time period. Because it’s 1917, Murdoch is 56 so I had to think about that. Is he physically different? What has happened to him in that amount of time? That was a bit easier than I thought, but it’s a bit like reconnecting with an old friend. I liked going back to Toronto because it had changed but not dramatically so. I’ve currently just done another jump to 1936 and that is very, very different because it’s post-War and things were very different in Toronto after World War I. Get the latest news on Maureen Jennings from her website. What did you think of “Game of Kings”? Let me know in the comments below! 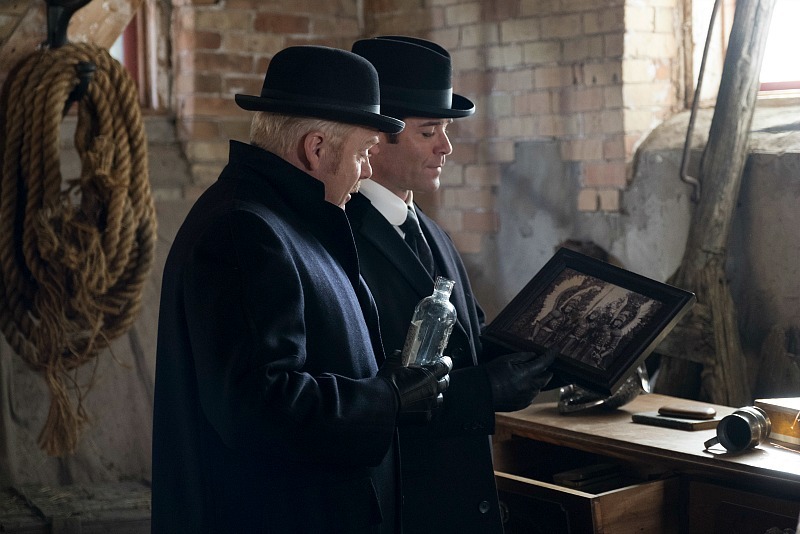 The fans have spoken and the vast majority of you loved last week’s Detective Watts-centric episode of Murdoch Mysteries written by Lori Spring and mystery author Robert Rotenberg. But an equal number of you, aside from the thumbs-up, wanted to know where Constable Crabtree was. Good news! As you can see in the above photo, Crabtree is back in Toronto for this Monday’s instalment. 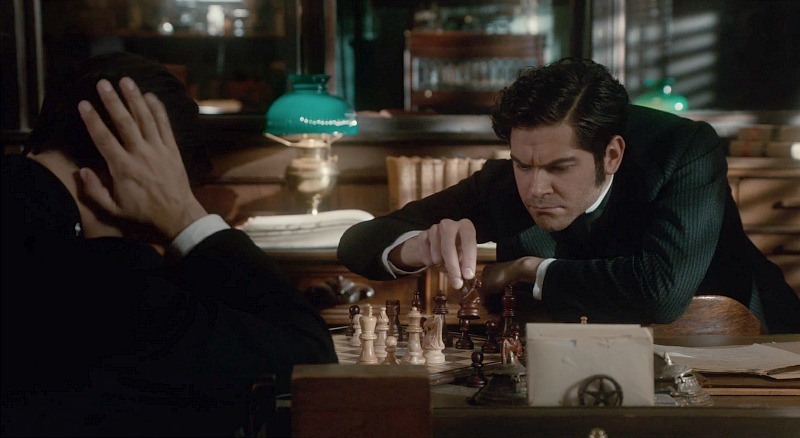 Murdoch and Brackenreid send Crabtree undercover at a chess tournament to unravel the murder of a Russian master. And here are more tantalizing tidbits I can serve up after watching a screener. Also, look for my interview with Maureen Jennings after Monday’s broadcast! And listen to my interview with MM composer Robert Carli! An angel visits Markham, Ont. I can’t remember the last time I felt spooked out by the first scene of an episode of Murdoch. I definitely got chills watching this. Kudos to director Peter Mitchell for nailing the shot and capturing the truly disturbing moment and atmosphere so well. Also? The implement used to dispatch the victim makes show history. Suffice it to say, one is better at this game than the other. Murdoch’s inventions to the rescue! In order to glean much-needed information, one of our characters utilizes one of William’s inventions … which leads to a very funny moment between Crabtree and Inspector Brackenreid just outside Station House No. 4. I’m beginning to think Julia’s protégé is up to no good. Let me know if you feel the same way. Win a copy of Investigating Murdoch Mysteries! It’s the most wonderful time of the year, when we celebrate family and the spirit of giving. 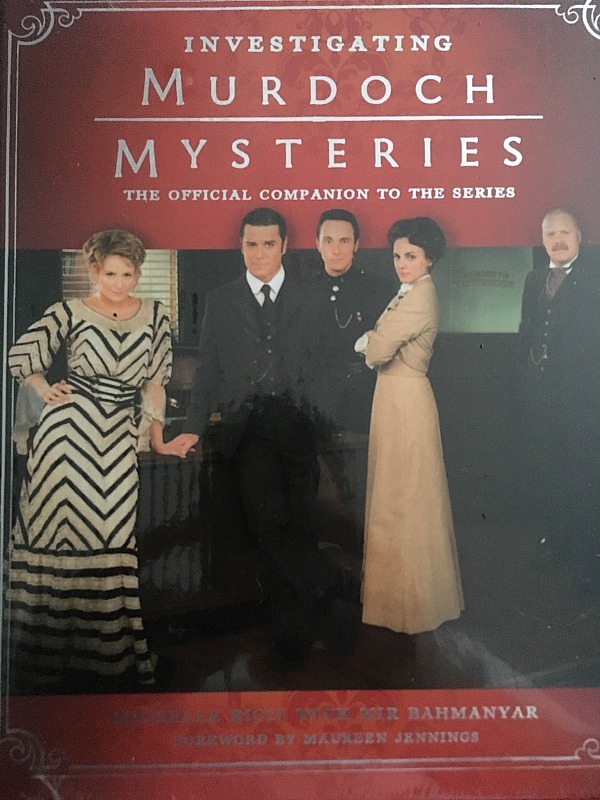 As a thanks to all of the Murdoch Mysteries fans who read our reviews and interviews, we’re giving away one (1) copy of Investigating Murdoch Mysteries: The Official Companion to the Series. Written by Murdoch Mysteries co-executive producer Michelle Ricci and Mir Bahmanyar, and with a forward by Maureen Jennings, it makes the perfect Christmas gift for any fan. How can you win this awesome book? Simply comment below, describing your most memorable Christmas ever. It could be a great present you gave or received, or maybe it was just being with your family. Murdoch Mysteries gives us fantastic stories every week, and we’d like to hear yours. We’ll pick a winner on Friday, Dec. 16, at noon ET and will make the announcement on this page. Good luck! UPDATE: Congratulations to Peggy Salazar! She’s the random winner of a copy of Investigating Murdoch Mysteries: The Official Companion to the Series. A sincere thank you to everyone who shared their Christmas story on this page. 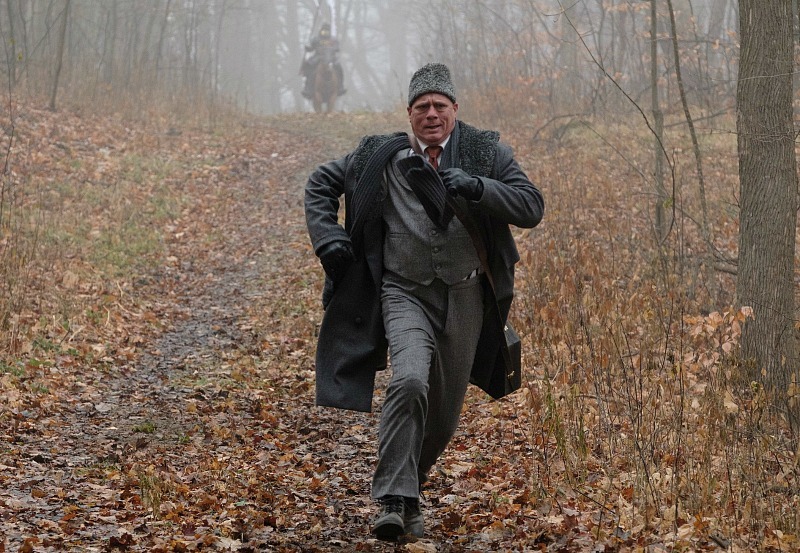 And don’t forget: Murdoch Mysteries‘ “Once Upon a Murdoch Christmas” airs Monday, Dec. 12, at 8 p.m. on CBC. It just makes sense to have Maureen Jennings write the origins episode of Murdoch Mysteries. After all, the author created him. Back in 1997, long before Yannick Bisson straddled a bike and drove into viewers’ lives eight seasons ago, Jennings published her first Murdoch mystery novel, Except the Dying. In 2000, Shaftesbury Films optioned the novels for television, which led to three TV-movies with Peter Outerbridge in the titular role. On Monday night, the franchise came full circle as Jennings’ script for “Shipwrecked” brought Outerbridge and Bisson together on the small screen. We spoke to Jennings about the episode and her thoughts on the state of the franchise. I know we’re eight seasons into Murdoch Mysteries with Yannick Bisson in the starring role, but is it still weird to see your creation on television? Maureen Jennings: Oh, no. He does a fabulous job. It’s his Murdoch now, that’s for sure. Obviously the show has evolved over the years and has changed from what has been in your seven novels. What are your thoughts on the evolution of the franchise? I feel very lucky because it hasn’t strayed that far over the last eight years. Early on, someone had a brilliant idea—it wasn’t mine—to move us up in time. You can put out the books in for or five years and move the fictional timeline by a few months. But in terms of television, we’re advancing a year which gives a lot more scope to what was happening at the time. I think it was a really good idea. Do you watch the show every week? How did the whole idea for Monday’s episode, William Murdoch’s origin story, come to be? I love answering this question. We were actually in Halifax a few years ago and they have a fabulous museum there. What I didn’t know was that a lot of people from the Titanic washed up there. It’s gruesome, but they did. They have a lot of the artefacts that they found on the bodies in that museum. I was looking at that and thought, ‘Wow, isn’t that interesting what you can tell from what somebody was carrying in their pockets?’ One of the men had gold coins in his pockets, which is a morality tale because they didn’t do him any good. I had long before established that Murdoch grew up in Nova Scotia, so this really got me going. It was actually a short story called ‘Wreckwood.’ That is the term they used in Nova Scotia to refer to a piece of the boat that they had found. It was very respectful. It was their way of honouring those ships that had foundered on their shores. I then changed the title to ‘Shipwreck’ and wrote a novella, which was intended for adults. It was a Murdoch story intended for a slightly different audience. I had framed it as Murdoch telling the story to his grandchild and that was really fun to to. I always enjoy it when people talk about their past, so that’s really how it started. Was it always the plan to have Peter Outerbridge cast as Father Keegan? We absolutely wanted Peter in with Yannick. Everybody wanted Peter in, we just had to figure out the scheduling. He was happy to be there too and it was a lovely moment on many levels. Peter, the first Murdoch was there with the current Murdoch and they worked together. It was really nicely done. It was a fabulous experience. Did you get a chance to watch any scenes filmed? Yannick wasn’t there the day I was. We were there the day they filmed in Sutton, Ont., filming the shipwreck scenes. We went to a gravel pit to film the shipwreck. It was cold and wet and they were using rain towers to simulate the storm. It was one of the most exciting things I’ve ever experienced. There was Peter as Father Keegan, getting soaked to the skin and doing brilliantly. I know scripts go through many edits. Were there any important plot points featured in this episode? We had to work hard in terms of bringing together the two storylines. That was much more difficult that what I’d thought originally. One of the writers, Carol Hay, came up with the idea of rather than trying to link the two stories in terms of the plot, why don’t we just link them together in terms of theme and have this story of William’s relationship with Father Keegan be paramount. I thought that was very clever and it worked. I enjoyed seeing young William and seeing his curiosity and Catholic faith established. I was not raised in any way Catholic, but I went to a Catholic university—which was then called Assumption—and I was so impressed by the fathers there. That has definitely morphed into Father Keegan. And I think that, really, the young Murdoch is the young me. Murdoch Mysteries returns with new episodes on Monday, March 16, at 8 p.m. on CBC.